Another trophy from England, thanks to awesome friends, this is a house brand chocolate that’s an interesting take on Mexican chocolate. Instead of the orthodox chili and cinnamon route, this veers off into Mole territory. It’s definitely an interesting mix: four kinds of chilies, plus some thyme, coriander, clove, allspice, and almonds and tortilla. The chocolate is fairly smooth and lusciously dark, and not excessively bitter. Once the chocolate starts to melt and settle in, you detect the almonds, providing a subtle texture for the chilies to follow. Smoky ancho, chipotle, chipotle and pasilla are the superfecta of mole sauce – so why are these other spices here? Clove and coriander likely provide higher notes – barely detectable but there – to balance the deep dark taste of the mole. Now, interestingly enough, (but lesser known?) 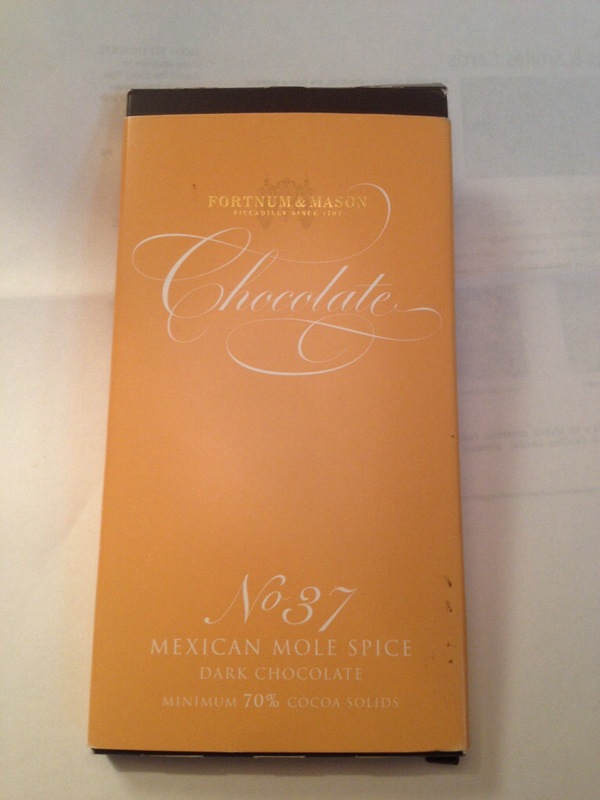 mole sauce in its original forms did not have anything to do with, let alone contain, chocolate. About the only thing they do have in common is a chocolate color. I would be curious to see if this bar could be improved with additional, or replacement, ingredients: pumpkin seeds, cinnamon, or… Wait for it! Bacon bits.